I don't know why I keep busting my hump looking for a new job when it appears to be totally unnecessary. Nearly every day I receive an email from someone, somewhere, who claims to have hundreds of thousands, even millions of dollars to give me just for the asking. Think I'm joking? Here's a snapshot of emails I've received over just the last 2 weeks. Microword Corporations customer service people took the time themselves to tell me that, "Your email address won a cash award of Four hundred and eighty eight thousand six hundred and twenty euro (Ђ488,620.00) Contact Our Foreign Transfer Manager for claims." I hardly doubt they would have gone through all that trouble if it wasn't true. And this one FOR SURE has to be real. It's from Microsoft and says it is sponsored by Bill Gates himself! "We are pleased to inform you of the release of the long awaited results of Sweepstakes promotion organized by Microsoft, in conjunction with the foundation for the promotion of software products, (F.P.S.) held this October 2009, in Spain. Where in your email address emerged as one of the online Winning emails in the 1st category and therefore attracted a cash award of 250,000.00 (Two Hundred and Fifty Thousand Euros) and a Dell laptop." Plus, you know if they're including a Dell laptop it has to be legitimate. Dell is a highly respected company and would never be part of a scam. But thank God my email spam protection is up to date and smart enough to provide me this helpful heads up. It says right on it, "Warning: This may not be from whom it claims to be. 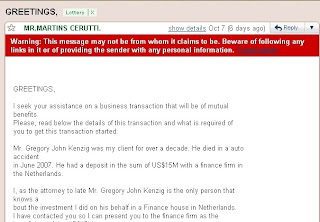 Beware of following any links in it or providing the sender with any personal information." And because I have safeguards like this to tell me that this email is bogus, I can be confident that the other 13 notifications are real. I did some quick math and determined that if I reply to all of those, I will soon be rolling in it to the tune of over $67 million! So don't feel sorry for me that I can't seem to find stable employment these days. After replying to all of these emails I'll be doing just fine. But I'll also be busy as well. It looks like I have at least 5 funerals to attend in Africa. It's the least I can do after they so kindly included me in their wills. I wish I had that many offers to meet single men. My colleague got the best one ever yesterday. He's being given thousands of dollars to make up for the losses he may have suffered from scam emails! What a coincidence, I just got a phone call from Ed McMahon. I'll tell you about it later. Right now I have to go withdraw some money from my bank account to fulfill my eligibility. That's such a coincidence. I get those same e-mails. How weird is it that BOTH of our e-mails addresses turn up in these cases for millions of dollars? prefers her fantasy life - You can have all the offers you want... You're just not signing up for the right kinds of emails. roger - I never forget my true friends. In fact, if you send me $10,000 right now, as a token of your commitment to our friendship, I will give you $1,000,000 when I receive my prize money. april - Too funny. Apparently the scamage knows no bounds. rick - Ooh creepy. A phone call from a dead guy! Forget about the money... get a priest! jd - Because... you and I are among the chosen people. Everyone else dreams of being as fortunate as us. Promise? Because I'll have that check in the mail tonight! I get a lot of emails from someone named "Tarjetas Bubba." They're all in Spanish, though, so I don't know if he's offering me money or not. I just think "Tarjetas Bubba" is kind of funny. I feel your pain Jeff. I've had a similar spam experience, though mine revolved around an alleged need for a tune-up down below. Alleged. roger - Uh, if you don't mind... can you please send that PayPal? I don't take checks. Thanks friend! absepa - I get an inordinate number of emails written with Asian characters. They look really cool and everything but like your spam, I have no idea what they're saying. Oh, and I think Tarjetas Bubba sounds like a redneck Target shopper. babs - Sounds good. And then we can go out and drink some champaign later on to celebrate our new fortunes. chubbs - I read that post... very funny! But isn't it nice to have so many people who are concerned for you? I have a bridge in Brooklyn I can sell you for next to nothing. You'll make millions on fees. I haven't been blessed with any of those e-mails yet. I'm still getting ones for enhancement of body parts that I don't possess. I'm thinking the fact that they're so concientious as to work so early in the morning... I mean, c'mon, 4:44am! Although now I'm thinking that those emails I've been deleting in Cyrillic might possibly be a mistake. Bummer. Hey! Here I thought *I* was the winner! I got those exact emails too! Hrumph! Now my plans for that mansion, limo and private jet are dashed. Why work when you can just get money for free over the internetz? I've foolishly been deleting all my get-rich-quick e-mails. If only I'd answered them all, I could have made millions by now. When you get your money, please buy me a time machine.